Silver__Grey_Square_Envelopes is rated 5.0 out of 5 by 3. Rated 5 out of 5 by Kayla from Great Quality! The item I purchased was a square 6x6 silver metallic envelope. Beautiful paper and wonderful quality! I purchased it as a sample, along with 4 other items and was impressed with all of the items I received. Rated 5 out of 5 by Mini from Recent pirchase! These envelopes were perfect for what I needed!!!! Try this link: http://www.jampaper.com/ecom/index.asp/show/detail/cat/52/prd/639/c/2705/s/1522 - if not please email at [email protected] Thanks! Square Envelopes are the ultimate sign of a fashionable invitation. And they just got even better. 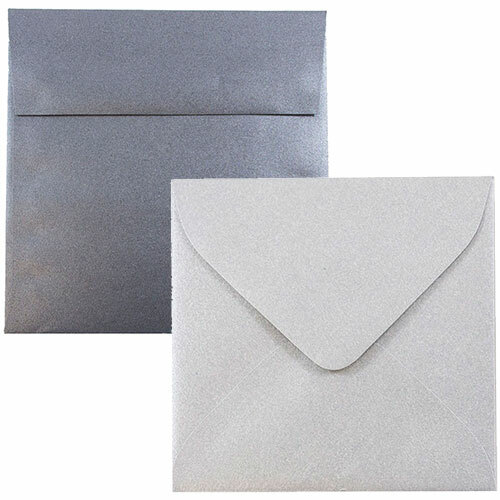 Due to the classic color and cool demeanor, Silver and Grey Envelopes go with everything! You can pair any color invitation and the smoky or shimmery envelope will undoubtedly flatter it. And because square envelopes aren’t the easiest to come by, we offer them in an array of different shades and sizes. Choose something more refined like a deep Charcoal or go for a flashier option like Silver Stardream. If you’re not mailing out an invite, mini Silver Square Envelopes make for charming seating cards and table decorations. Smaller in size. Just as much sparkle.